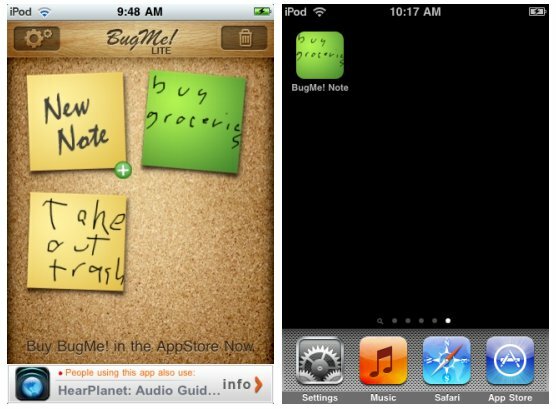 Home Applications Free version of sticky note app BugMe! Lite is available! Free version of sticky note app BugMe! Lite is available! Bug Me! Lite is new free version of popular sticky note app BugMe! released by Electric Pocket for iphone touch. With this app you are able to type or create handwritten quick notes, set reminder alarms to keep them on-task and on-time, save created notes on your iPhone's home screen as well as share them by e-mail or twitter. BugMe! Lite offers the same features as the previous version, that includes ability to change the color of the ink or background for your notes, but additionally free version includes advertisements on the bottom of the main screen and is limited to three notes.A favorite feature with BugMe! is the ability to quickly choose alarm times from a pick list of time intervals - for example 20 minutes or “top of the hour”. This makes the application very effective for informal, lightweight reminders, such as watching a TV show, returning a phone call, or plugging the parking meter. BugMe! Lite is all you need in case you're not going to keep more then three notes at a time. While BugMe! Lite is free, the full version of BugMe! for iPhone is available in the Apple App Store at an introductory rate of $0.99.